Handsets and 5G services will roll out slowly over 2019, but don't expect the technology overnight. Qualcomm opened its Snapdragon Technology Summit as a cheerleader, evangelizing the 5G wireless technology that’s rolling out worldwide from chipmakers, carriers, and smartphone makers. Qualcomm’s first “5G-ready” smartphone processor will be the Snapdragon 855. Qualcomm executives provided a “state of 5G” update—part technical summary, part hype. 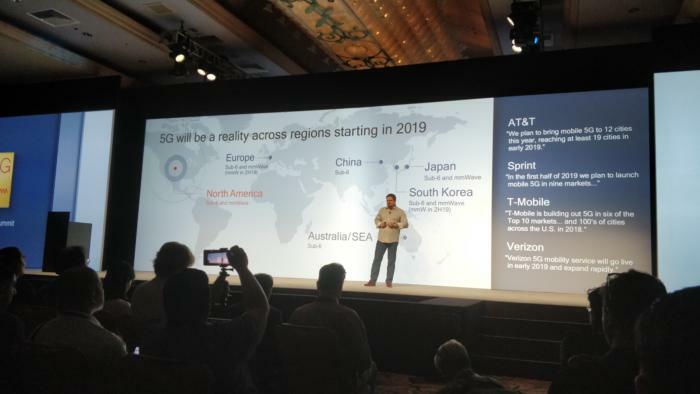 AT&T and Verizon also joined Qualcomm on stage to provide updates on their own 5G rollouts, as well as to promote the new standard. 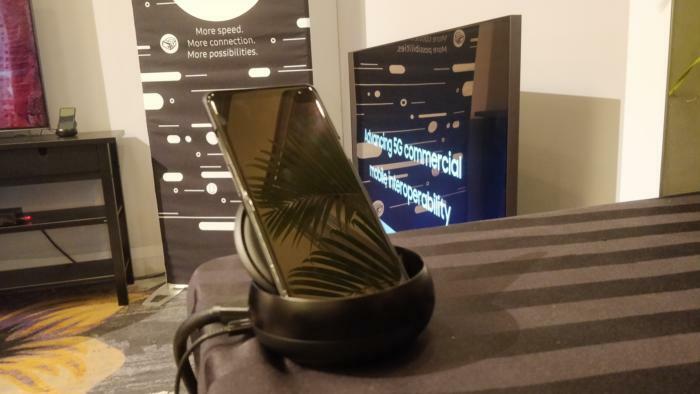 AT&T and Verizon provided “live 5G networks” for use in the hotel hosting the Snapdragon Technology Summit, and Amon held up a first reference handset with a 5G chip inside it. It’s proof, Amon said, that 5G is right around the corner. This is the Qualcomm 5G NR reference device. Though the screen isn’t powered on, it was streaming video to a large Samsung TV out of frame. What this means: There’s a considerable dose of hype around 5G, and part of that is to simply get users interested. Why does a consumer need 5G? Is it for faster speeds? Executives gave one example: downloading all episodes of a streaming video series as you walk on a plane. But there are questions about how broadly and how quickly 5G infrastructure will roll out, too. One big question: How much will all of this cost? Unfortunately, neither the carriers nor Samsung would say. One of the challenges of 5G, though, is simply defining it. So-called 5G technology is really two different pieces: narrow frequency bands in the sub-6GHz range, and the so-called “millimeter wave” spectrum. While the sub-6GHz portion of 5G offers speeds comparable to today’s 4G LTE, it’s the millimeter wave portions of the spectrum that can push throughput to the multi-gigabit level—but the signal strength falls off quickly over distances. 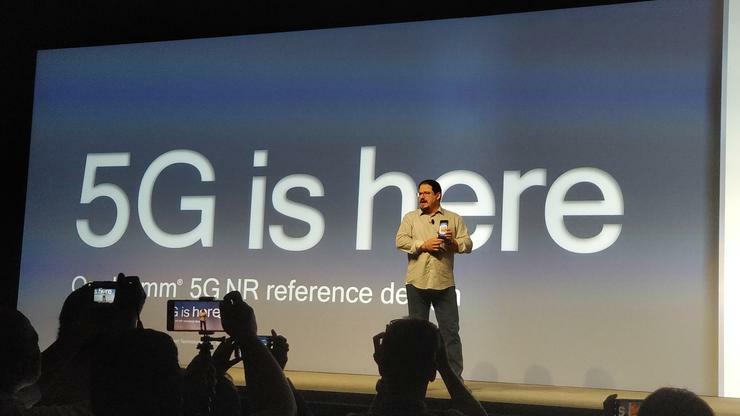 All of the major U.S. wireless carriers have announced 5G plans; in the case of Verizon, the company launched the first 5G broadband network in four cities in October. AT&T has also announced its own 5G rollout plans, including major metropolitan areas in all parts of the country. Qualcomm invited both companies up on stage as partners in its 5G rollout. The U.S. carriers plan to support both sub-6GHz as well as millimeter-wave technology, Amon said. In October 2018, Amon said, the first 5G NR over-the-air call was placed on a mobile device. According to Qualcomm, 5G is being quickly rolled out around the globe. Nicki Palmer, chief network engineering officer for Verizon, reminded users that its 5G home rollout was designed specifically for high-speed home broadband. As a result, Verizon has a first-mover advantage. “5G absolutely promises to change the way we live, play, work and learn,” she said. Verizon showed off mobile demos of how well its 5G technology network works, with gigabit speeds at about 3,000 feet away from the originating point. Mobile support will come in early 2019 with the Samsung 5G phone, as well as a Motorola Z3 that will include a 5G module, Palmer said. (It’s not clear whether those modules are in fact 5G NR compatible, however, according to analysts at the Qualcomm event.) A separate recorded demonstration of its fixed 5G home network indicated that it could transfer about 883Mbps of throughput. Verizon and Samsung teamed up to produce this battery-powered, wireless 5G access point using Verizon’s network. Unfortunately, neither company would disclose details. Kevin Petersen, senior vice president of wireless marketing at AT&T, said that the company believes the first 5G technologies will be focused on businesses: video “broadcasting in a box,” for example, where a camera operator would shoot and upload the video they captured almost instantaneously. “5G makes those things you’re doing today better,” Petersen said. For 2019, AT&T pledged to have it own 5G smartphone, without disclosing what it would be, or whether it would support sub-6GHz technology or millimeter wave. The one segment of the market that was sparsely represented at the event was smartphone makers, to explain their plans for 5G. Verizon and Samsung let the cat out of the bag Monday with their announcement of a 5G phone, which will ship during 2019. But it will face numerous hurdles, not the least of which may be battery life. Justin Denison, senior vice president of Samsung, appeared on stage to reiterate the phone announcement, but offered no other real details. 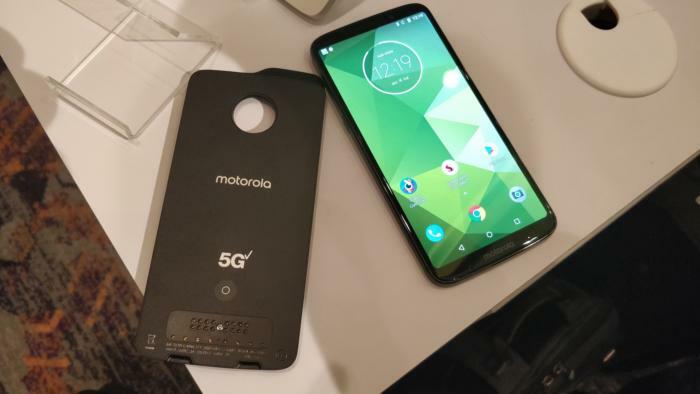 Though Motorola executives didn’t appear, the company showed off a Motorlola Z3, which will include an add-on MotoMod that supports 5G. In the second half of 2019, all of the flagship customers that Qualcomm serves will be “clearly moving toward 5G,” Amon said. One analyst said 5G is going to be a necessity: “If you are a smartphone company and don’t have 5G in 2019, you will lose unit market share,” said Patrick Moorhead, principal analyst at Moor Insights. Now that the specification has been written, chipmakers are jockeying for position in the 5G space. The same development process has more frequently played out in the Wi-Fi market, where router and modem makers have developed “pre-standard” chips, only to tweak them when the final standard was published. This same process allowed Qualcomm to announce its discrete X50 5G modem in 2016, well before 3GPP published its final standard. That chip has now been respun, and is Release 15 compliant, Qualcomm executives said. Alex Katouzian, senior vice president and general manager of mobile at Qualcomm, announces the Snapdragon 855. Two of Qualcomm’s biggest rivals, Intel and Samsung, are also developing 5G technology. Intel recently said it has pulled in the release of its first 5G modem, the XMM 8160, by a full six months. But the chip is still expected to ship at the end of 2019, leaving 5G phones using it (such as a next-generation Apple iPhone) very much in doubt. 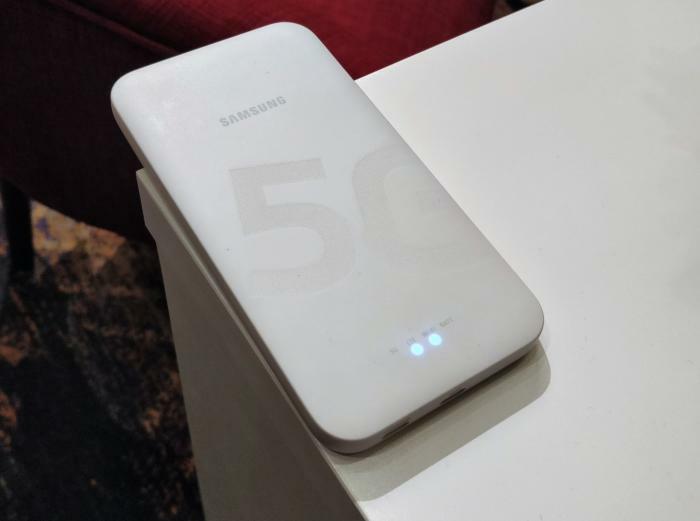 Samsung has also built its own modem, the Exynos Modem 5100, which it claims was the first to be compatible with the 3GPP Release 15 specs, and which will almost certainly be used within its own phones. An upcoming front in the 5G wireless chip battle will be how each manages to integrate 5G into their existing controllers. For Qualcomm, that has the potential to affect the future phones of its existing customers, which include Google, OnePlus, and the U.S. version of Samsung’s Galaxy phones. 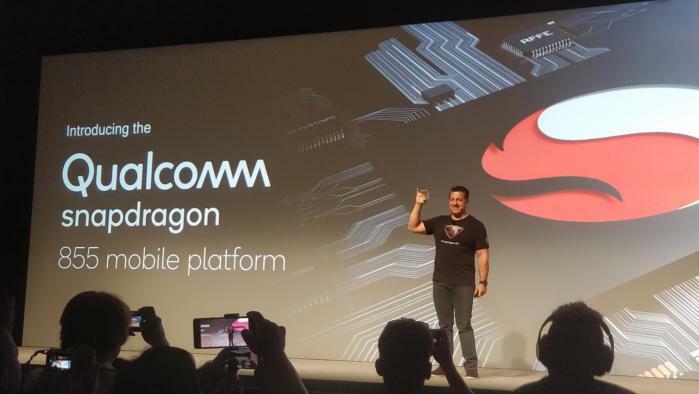 Qualcomm’s flagship mobile chip is the Snapdragon line, and the new version the company announced Tuesday is the Snapdragon 855. Qualcomm said Tuesday that the Snapdragon 855, will “support” multi-gigabit 5G technology. (Though the Snapdragon is an integrated chip with a modem, DSP, GPU, and CPU, it does not natively support 5G. A “5G” phone would also need to include the discrete X50 modem chip, Qualcomm executives confirmed.) Qualcomm is claiming that it will be the first commercial mobile platform to support 5G, executives said. AI will again play a role within the Snapdragon 855, with a fourth-gen AI engine that delivers what the company calls three times the AI performance of the previous Snapdragon 845. A dedicated computer-vision Image Signal Processor (ISP) has been included for computational photography and video capture, to recognize what the camera is seeing and take better photos. Qualcomm developed a 3D Sonic Sensor, an in-display ultrasonic sensor for authenticating smartphone users via their fingerprints, and through smudges on the glass. It will also read fingerprints through moisture. And finally, something called Snapdragon Elite Gaming, designed to bring next-gen gaming experiences to mobile users.